A systemized approach to the home buying process can help you steer clear of these common traps, allowing you to not only cut costs, but also secure the home that’s best for you. What are you looking for in a home? A simple enough question, but the answer can be quite complex. More often than not, buyers have been swept up in the emotion and excitement of the buying process only to find themselves the owner of a home that is either too big or too small. Maybe they’re stuck with a longer than desired commute to work, or a dozen more fix-ups than they really want to deal with now that the excitement has died down. Take the time upfront to clearly define your wants and needs. Put it in writing and then use it as a yard stick with which to measure every home you look at. As part of your offer to purchase, make sure you request an updated property survey which clearly marks your boundaries. If the survey is not current, you may find that there are structural changes that are not shown (e.g. additions to the house, a new swimming pool, a neighbor’s new fence which is extending a boundary line, etc.). Be very clear on these issues. Make sure you identify and uncover all costs – large and small – far enough ahead of time. When a transaction closes, you will sometimes find fees for this or that sneaking through after the “sub”-total fees such as loan disbursement charges, underwriting fees etc. Understand these in advance by having your lender project total charges for you in writing. Do you have specific questions about buying or selling real estate in the Santa Barbara area? 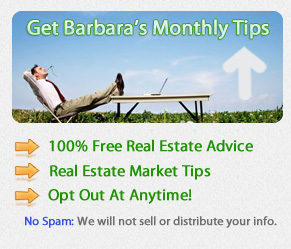 Ask to be setup on Barbara’s email-based home search to get instant alerts on price reductions and new homes for sale in Santa Barbara. About Barbara Reaume – Barbara Reaume is a professional Santa Barbara realtor for Coldwell Banker, with over thirty years of experience. People looking to buy a home in Santa Barbara seek out her advice on buying a single family home, finding a condo, or purchasing land as an investment. Visit the website and Facebook page or call 805-610-5403 for more information or to request a quick quote.